From our beginnings as a small, grassroots autism charity, we are so proud to have the province-wide impact on individuals and families that we do today. It was just over 10 years ago that Paolo and Clara Aquilini sat around a dining table with Katy Harandi. Together, they envisioned an organization that would make a positive and lasting impact on the autism community in BC. 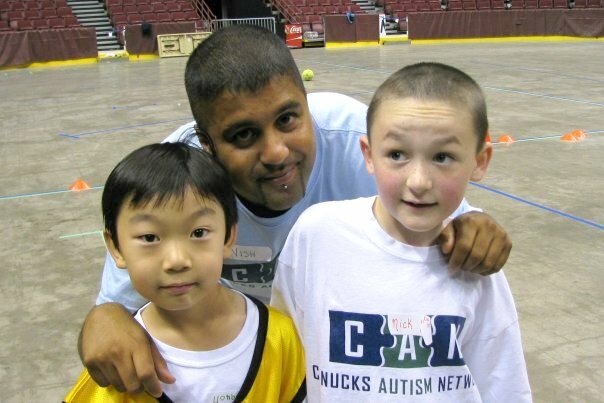 With the support of the Canucks for Kids Fund, Canucks Autism Network became a non-profit society on January 7, 2008. That year, we began with one soccer program and one family skate at GM Place (now Rogers Arena). A decade later, CAN delivers nearly 500 programs to 4,000 members province-wide. Since day one, we could not do what we do without the countless supporters who share our mission. Offered to just a handful of families, we launched I CAN Play Soccer as a two-day program at GM Place. After 10 years, guess which CAN coach is still around to guide our participants? Over the past decade, we have expanded to a wide range of sports and rec programs, allowing children and youth with autism to explore physical activity on land, water and ice. Beyond sports, our social programs and overnight camps have allowed participants to try new activities, develop lasting friendships and make lifelong memories. In addition to sports and rec programs, one of the pillars of our mission has been to raise autism awareness. That’s why in our first year, we launched We CAN Be Friends, a free curriculum-based autism awareness program for elementary classrooms. By raising awareness among BC’s youngest students, we can help educators build a brighter future of acceptance, empathy and inclusion for individuals with autism. After launching to a handful of schools in the Lower Mainland, the program has now grown to 275 schools across BC. 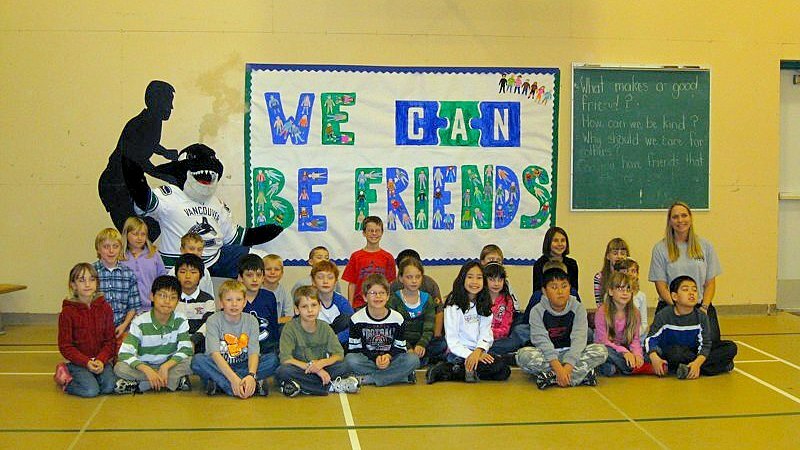 In Spring 2011, CAN launched multi-week sports and rec programs in both Victoria and Kamloops. Today, CAN offers programs in three Vancouver Island communities (Victoria, Cowichan Valley and Nanaimo) and two BC Interior communities (Kamloops and Kelowna). In total, CAN programs are actively delivered in 79 communities across BC. In celebration of World Autism Awareness Day, we hosted the first-ever CAN Family Festival at Jack Poole Plaza. Held in Downtown Vancouver, the annual event featured an awareness walk, exhibitors, games, and live performances. For six years, the CAN Family Festival was an annual centerpiece in our efforts to bring families together, increase awareness and raise vital funding for our programs. 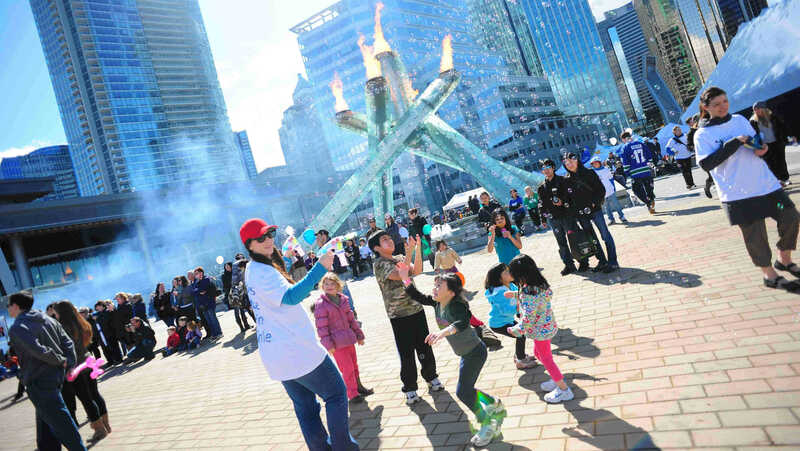 April 2012: The cauldron at Jack Poole Plaza was lit to celebrate CAN Family Festival for the first time. For ten years, CAN family events have provided invaluable opportunities for both parents and kids to connect with others in the autism community. Events like the Rogers Arena Family Skate and Van Dusen Gardens Festival of Lights have marked the CAN calendar as annual highlights for our families. 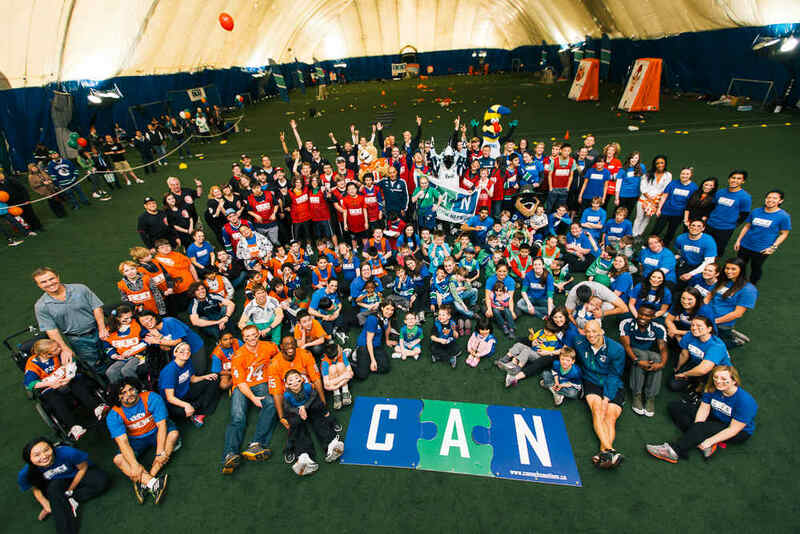 In March 2013, we hosted the first-ever CAN Sports Day. With the support of the Vancouver Canucks, BC Lions, Vancouver Whitecaps FC and Vancouver Canadians, participants were treated to a truly memorable experience playing alongside their local sports heroes. Held in Sportstown Richmond the first year, it was moved to BC Place in 2014 where it has been held ever since. Our vision is for all individuals with autism to feel understood, accepted, and supported in all community spaces. In 2013, we began delivering autism training to sports and rec providers, ensuring that our ability to engage individuals with autism extends outside our walls too. Since then, we have expanded these efforts to include training across public sectors, including first responders, educators, community recreation providers, and many others. Across BC, our workshops have been delivered in the far reaches of the province, including Northern BC, as well as First Nations communities. In the summer of 2016, CAN workshops reached a pivotal milestone, becoming eligible for Coaching Association of Canada NCCP Maintenance Certification Points (PD Points) and BCRPA Continuing Education Credits (CECs). We are humbled that so many families have made us a part of their lives. Today, we impact over 4,000 individuals and families with autism on an annual basis. With a high ratio of support in all of our programs, we can be proud that each and every one our participants has a volunteer, support worker or coach that has personally supported them and celebrated their accomplishments. At CAN, collaboration is among our core values. We recognize that we cannot achieve our vision alone. After hearing about the struggles that individuals and families with autism face with air travel, we partnered with the Vancouver International Airport (YVR) to launch I CAN Fly. Beginning with the annual Accessibility Tour, families with autism are invited to go through the entire pre-flight process. Once families are ready to travel, they can access a step-by-step video and pick up a complimentary YVR Resource Toolkit that features checklists, maps and activity storybooks to best prepare children with autism for what to expect. After successfully delivering the I CAN Fly program for three years, it was expanded to Kelowna International Airport (YLW) in November 2017. We could not do what we do without our valued donors, sponsors and supporters. In order to shed light on both the challenges and successes of our participants, while raising vital funding for our programs, we held the inaugural Reveal Gala. 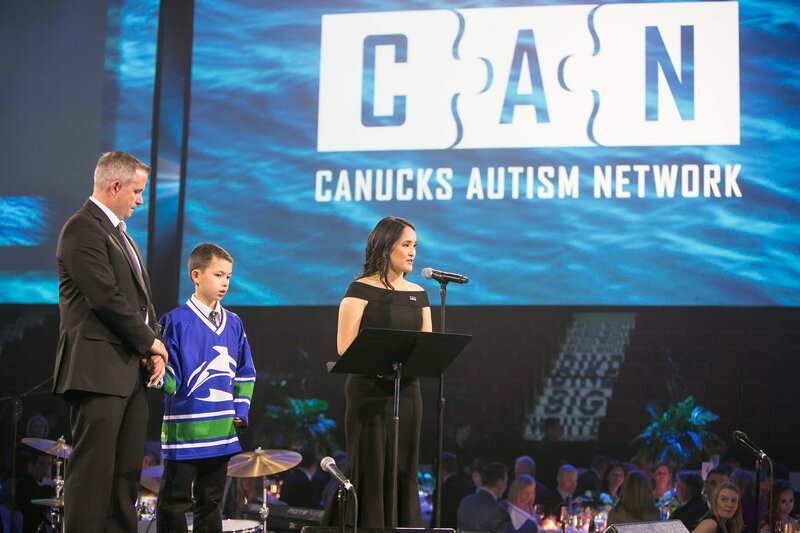 Transforming Rogers Arena into an intimate venue for just over 500 guests, the first gala raised over $800,000 for CAN programs. Over the past three galas, guests have been treated by incredible performances from Sarah McLachlan, the Tenors and Lola Lennox. With the Vancouver Canucks and Canucks for Kids Fund representing our longest-standing supporters, it was only fitting that Rogers Arena became the first NHL arena in Canada to feature comprehensive autism accessibility. In addition to over 50 event staff receiving CAN autism training, sensory kits (featuring noise-cancelling headphones for loan, a sensory toy, ID bracelet, visual storybook, arena map and game-night timeline), a quiet room and fan text service have been made available to individuals and families living with autism for all Canucks games, events and concerts. Have you been a part of any of the above 10 milestones within the past 10 years? Join us in celebrating a decade of “I CAN”. The CAN Birthday Festival on Saturday, July 7 at Surrey Civic Plaza is FREE and open to the public. Learn more at canucksautism.ca/bdayfest. Let’s celebrate!